As you know, living from a state of gratitude is one of the keys to creating a happier, more fulfilling and abundant life. When you wake up in the morning though, like many of us, you may not feel instantly positive and overwhelmingly grateful – especially if you haven’t slept well or the alarm jolts you awake! The good news is you actually consciously choose to generate a state of gratitude each and every morning. And doing this is much faster and easier than you may think! Doing so helps you become aware of what you’re grateful for in every moment, and as you do this, more and more opportunities will begin to present themselves to you, and you’ll begin to have a much freer, fuller, more expansive experience of being alive. Two psychologists, one from Southern Methodist University in Dallas Texas, and the other from University of California at Davis, recently conducted a very interesting study about the extraordinarily positive impact of gratitude on people’s overall well-being. The psychologists split several hundred people up into three groups. The people in all three groups agreed to keep a diary that they would write in at the end of each day for the duration of the study. The first group received no instructions as far as what to record in their daily diary, and so they chose to write about whatever happened during the day, either positive or negative. The second group was instructed to write only about unpleasant experiences they’d had throughout the day. The third group was asked to write only about things that had occurred that day that they were grateful for. The results of the study showed that the third group, those who wrote their daily gratitudes down at the end of each day, experienced higher overall levels of alertness, enthusiasm, determination, optimism and energy. This third group also experienced less depression and stress, were more likely to help others, exercise regularly and made greater progress towards their personal goals. The benefits of meditation that come from having a daily gratitude practice are infinite. Living from gratitude has the power to transform all areas of your life, so how do you get yourself into the HABIT of living with gratitude? One of the ways that you can generate a field of gratitude each and every day, even when you wake up not feeling too grateful, is to incorporate a simple but powerful 30-second morning gratitude practice into your morning routine. Each morning when you wake up, there’s a moment that you realize that you’re awake and alive. Maybe the sun woke you up, or an alarm clock, or your children or your pet jumped on your bed. However you wake up, this awakeness is something to revel in! I’ve lived long enough to know that not everyone wakes up in the morning. My dear friend Wayne Dyer went to bed one Saturday night with a calendar fully booked with speaking engagements and other commitments for the next three years… and he simply never woke up the next morning. So as you start to wake up in the morning, just notice that you’re waking up. Then, verbally acknowledge to yourself and to the infinite intelligence that moves through all things that you are simply grateful for the opportunity to be awake and alive this day. Don’t let your feet touch the floor until you are in a state of gratitude. After so many years of doing this morning gratitude practice, generating and expressing gratitude first thing in the morning now comes pretty naturally to me. But there are days when it doesn’t, when it just takes a bit more time and energy to put myself in that state. And that’s okay! I know from personal experience that generating as state of gratitude will absolutely influence the type of decisions I will make, the opportunities I attract to me, and the overall type of day I will have. And if you take this 30-second morning gratitude practice on, it will absolutely create these same results for you, too! So I encourage you to do an experiment and make this simple but powerful gratitude practice a part of your morning routine for the next seven days. Living from gratitude has the power to transform all areas of your life. Between the time you’re beginning to open your eyes in the morning and the moment that your feet hit the floor, make the conscious choice to put yourself in a state of gratitude. Remember that not everyone’s eyes opened that morning, and that this brand new day you’ve been given is a gift. For more inspiration, here’s some of my personal favorite gratitude quotes. Do this morning gratitude practice for seven days, and you’ll be amazed by how this quick and simple practice impacts your outlook and the results you generate each day! Another huge benefit of gratitude is that it is harmonious with the frequency of abundance. This means that more gratitude you authentically generate, the more abundance you will naturally attract into your life! It’s Universal Law. 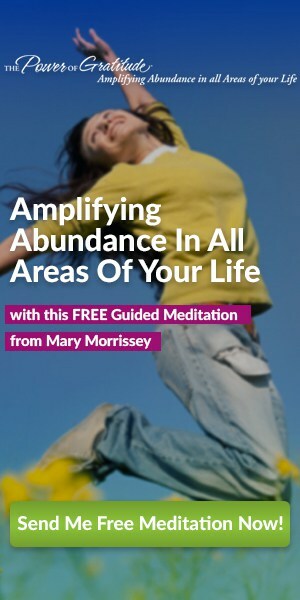 For a free guided meditation that will help you more easily shift into a state of gratitude, click here. I always woke up saying good morning world its a brand new day hiphiphiphip hooray. I am Grateful that I discovered YOU! I am grateful for the opportunity to sit and watch the video uninterrupted by children, clients, pets. Just a moment to myself that I could use to focus on me. Thank you! It is so simple but definitely we do not think that way dear MARY . Very inspirational and definitly the power of positiv thoughts attract from univers goodness and good people . Think of Yhe Sycret . I listen to you today and thank you . Will try the 7 days practice and maybe will continue after words . I hear Hoday , tv reporter she writes every moning why she is great full , seem silly at a time I listen to but her life got so much as reward . Why not let’s do it ! I am grateful for Jesus Christ, who died for me and has given me the ability to do great things, through Him. I am grateful that Archangel Gabriel has reached out to me. I am moving along my path to remembrance quickly. I am grateful for the trust, the guidance, the teaching, the assistance, and the honor to work with the Archangels. I am grateful for the amazing people that have been put in my path. Thank you, Mary. I am grateful for you and your guidance. I have kept a gratitude journal for a number of years now, writing many things for which I am grateful each morning. I write whether I feel grateful or not. Sometimes it helps me feel more grateful, but not always. I have been living in extreme chronic pain for the past 7 years and it makes it extremely hard to feel grateful. This is a huge challenge for me, because I have generally been a very grateful person regardless of what is occurring in my life. I do this practice quite frequently, usually unconsciously. I will try to be more conscious of doing this practice not only when I wake up, but before I go to sleep. It leaves a sense of peace. I am thankful for every aspect of my life, my faithful dog, my special companion, my family, my friends, and the ability to walk and have the full use of all my senses, and that I have a roof over my head, food to eat, and the ability to work and have productive work. My oldest brother just passed away very suddenly and I have really been struggling, particularly in the mornings. Difficult to face a new day with such sorrow and emptiness. I am going to make this my new practice; I’m sure this will help to get out of bed in the morning. Thank you! That Jesus is my savior. No doubt gratitude makes the mind and heart peaceful. We all crave for peace. Peace is health. Love you peace lovers. I am Ali from Pakistan. Hi, many years ago , my teacher told us to write each day five things we are grateful for. Through the years, I upped it up by many numbers, and a few years ago, my thinking of gratitude went to a different level. As you say in your video there is so much to be grateful for: the air, sun, moon, planet, water, our job. You who post these wonderful talks- thank you. I am grateful that there are individuals who are sharing information in videos, interviews, meditations. When I watch and listen, my food choices are more healthy and I have a much better attitude about my life. Very inspiring video – thank you. I’m grateful for many things but the one thing that came to mind when you asked, is the fact that I could sit around the computer without my glasses and read everything clearly. I did cataract surgery 6 weeks ago and I’m amazed at the clarity of vision I now enjoy. I’m truly grateful for the results of the surgery and that I could have afforded the procedure. I’m going to try to get into a state of gratitude before my feet hit the ground, starting tomorrow. I am grateful for opening this email and finding you. I tore the tendons off both elbows a year ago and are still suffering with pain and non movement. It has deeply affected me both physically and mentally.all they do is throw more pills at me.i am hoping this may help as i have got to the stage of wanting to give up.not wanting to wake up, not that i sleep due to pain. Am over the pain.depressed about the inabilityto do things i used to. Hope your meditations help me.thank you for sending me your email.hope its the first step to the rest of my life. I’m thankful for the environment I’m in now that I’m divorced. I don’t like that my 33 years of marriage came to divorce but I am thankful for the growing that’s taking place and the increase in my self-esteem. It hasn’t been easy but God put many blessings into my life to make this so. I’m thankful for the opportunity to invest in myself with newly found freedom, energy and motivation. I am very grateful to you Mary because you really resonate with me. I am very grateful to my wild and crazy husband for being wild and crazy loving and loyal. I will be practicing this very simple exercise every morning…and every night. Thank you! I AM SO GRATEFUL AND THANKFUL TO HAVE ACCESS TO SO MUCH USEFUL INFORMATION. THANK YOU & BLESSINGS TO YOU! Every morning I will add you to my gratitudes. I am so grateful for my husband. There was a time when I didn’t think I’d ever meet the man for me and have the home I’ve always dreamed of. Relationships are definitely not all roses & sunshine, there are a lot of thorns & storms. I am so grateful to have him in my life!